10 Tips For Anyone New To Yoga! The best advice I could give anyone new to yoga is to just show up. Don’t overthink it, just do it. Check your ego at the door and get ready to have fun. Allow your mind and body to be open to new experiences both physically and mentally. Yoga studios are not spaces for competition; they’re a starting point for an inward journey. So get ready to start yours!! Your first few classes might be a little confusing until you become familiar with the poses and breath. Know that it’s ok, we all have to start somewhere. Do the best you can to follow along and remember to avoid placing any type of judgement on yourself. Arrive early to your first class. That way you can register, get set up, acclimate to the space, and introduce yourself to the teacher. Don’t eat right before class and remember to drink plenty of water. Refrain from eating at least two hours prior your practice. Eating before can cause you to become nauseous during your practice and cause painful digestive problems. Also, drink plenty of water before, during, and after class (especially after a hot yoga class). Replenishing after class is important to help avoid soreness, cramping and dehydration. Bring a friend or family member along with you. Spread the joy and love of yoga… it might even help ease your nerves the first time around. Try to avoid clothing that is too baggy or loose fitting. It’s best to wear clothing that is fitted, moisture wicking, and breathable. And remember to take off your socks! Put your mat in the back of the room. 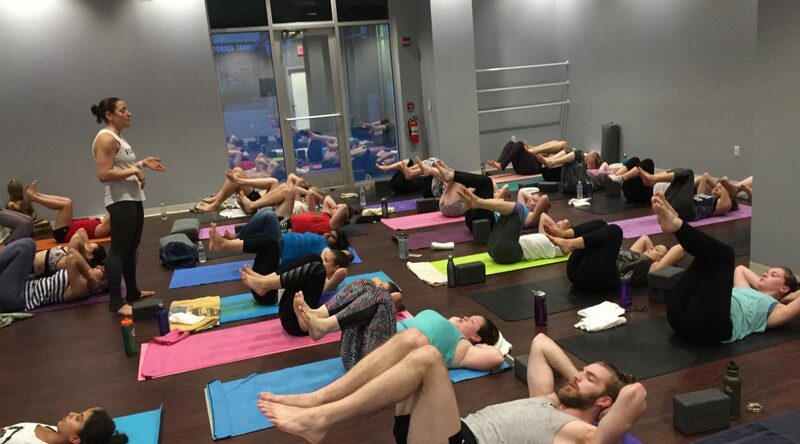 When I was new to yoga, I liked having a view of all the other yogis in the room. That way, if I needed a little guidance during a pose, or wanted someone to model the pose for me, I could look around at what my neighbors were doing. Bring either a small hand towel with you or a larger towel to place over your mat, especially during a hot class. This will help you from slipping and sliding during class and allow you to wipe the sweat from your eyes. Many studios allow you to rent or borrow public mats. However, it’s nicer, cleaner, and more sanitary to have your own. A good yoga mat is essential to helping with your grip and can provide a little extra cushion for your hips and knees during floor poses. My favorite mat is the 5mm Reversible Mat from lululemon. If you become emotional during or after a yoga session, it’s normal. Sometimes releasing tension in the body (especially in the hips) or when opening our heart (during backbends) you begin to release a ton of emotions too. It’s important to remember that anytime you work with the body, you are also working with the mind and the energy system, which is the bridge between body and mind. Therefore, emotional breakthroughs can be seen as markers of progress on the road to personal and spiritual growth. As you move, breathe and flow, remember to listen to your body. If something hurts, don’t do it, if you need a break, take a child’s pose. Remember, don’t take yourself so seriously, be sure to smile and have fun! Try several teachers and classes. Don’t be afraid to test out a variety of different teachers and classes until you find what’s right for you! You will figure out exactly where you need to be and what works for you! Last weekend was Memorial Day, or the unofficial start to summer. This marks the opening of pools, school years winding down, barbeques, and beach parties. As we prepare for summer and get ready for summer vacations, here are some tips to staying healthy during your summer travels. Like most of us, I always look forward to summer vacation. 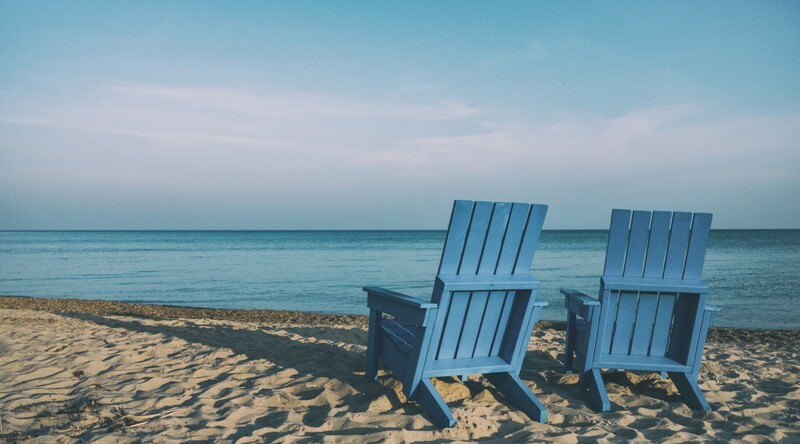 It’s a chance to sit back, relax, go to the beach, spend time with family and friends, read a book and do the things we don’t get to do during the rest of the year. When done right, traveling is the perfect way to detach and de-stress from our busy lives. However, when we go on vacation, it’s important to remember not to over-indulge too much and throw away all of the good and healthy habits we’ve created throughout the year. So be sure to enjoy your vacation responsibly. It’s about finding that balance and not feeling guilty when you need hit the reset button when you get back. “Sitting is the new smoking” is one of the most popular catchphrases these days regarding one’s health. In fact, many offices are now offering standing desks and waking meetings to their employees. Studies show that any extended sitting (i.e. plane, desk, car, etc…) can greatly increase one’s risk of death from cardiovascular disease and cancer. So when you head out on vacation this year, be mindful of how much you’re moving. If you’re taking a flight, get up every hour or so and walk around, long car ride- stop at a rest station, get your muscles moving. Maybe even do some of your favorite yoga poses! Maybe you’ll meet some cool people and discover some interesting places! Once at your destination, plan activities throughout your trip that will force you to get up and move- take a hike, snorkel, kayak, bike ride, walking tour, plan some activities that will force you to get up and move. Dehydration can cause headaches, fatigue, nausea, and anxiety, which can put a damper on your vacation. Dry, recycled air in airplanes and consuming alcohol while flying can lead to dehydration. To prevent this, drink plenty of fluids before your flight and be sure to have at least one cup of water per hour on the plane. At your destination, be aware of climate changes. Altitude, humidity and high temperatures can all cause you to dehydrate very quickly. To prevent this and the effects that come along with it, be sure to drink lot’s of water. It’s also a good idea to carry water with you at all times. Be sure to drink often to keep up with your needs. When you become thirsty, you are most likely already dehydrated. Eating on vacation can be a challenge for a lot of us. We have a tendency to overindulge and eat items we may not eat when we are home. To help you stay on track with your healthy eating habits even when you are away, plan ahead. Know where to find healthy options, bring your own healthy snacks (i.e. fruit, nuts, etc…), and avoid restaurants that offer fried or overly saucy food. If you do want to indulge, think about what else you ate that day and how it fits in with your calorie and fat consumption. It’s easier to eat dessert if you’ve been active and eating healthy. Think moderation and you should be fine! Remember, this is your vacation and your time to relax. It’s hard to relax when we are constantly being overstimulated by our cellphones, ipads, etc. These technologies can often cause us stress, anxiety, and poor mood. So unplugging for a while and be present where you are, it can be a nice change of events. Emails, FB. and IG, will all be there when you get back. Now is your chance to rest and unwind. Remember your mind needs this just as much as your body does. If you can’t go a week without checking in, perhaps allot yourself a specific amount of time each day to check your phone and email. Spend the 20 minutes you need and then put it away and get back to your vacation. If faced with a position where you need your phone on, maybe modify your notification settings so you can experience some moments of relaxation, without frequent interruptions. And remember, don’t over schedule yourself. Give yourself ample time to sleep. It’s your body’s chance to recharge from all you’ve put it through over the course of the year. The benefits of taking a vacation include, improved physical & mental health, and overall functioning. If you follow the steps above, you’ll come back from vacation feeling refreshed and renewed. Why You Need Yoga in Your Life- Especially When You’re Crazy Busy!